According to the 1968 catalogue, this organ was “built for the Earl of Normanton, at Ditchley, near Woodstock, Oxfordshire. Bought and restored by Noel Mander in 1967. Bought for the St Cecilia Hall by the University with the aid of a Government grant. Noel Mander thought the organ was built by John Snetzler in about 1750. The organ does not resemble other Snetzler organs, but the metal pipe marks are very similar to those in the 1777 Snetzler organ at Rotherham parish church. It is possible that these marks are those of Snetzler’s partner towards the end of his career, James Jones. Jones accompanied and erected the organ provided by Snetzler for the Edinburgh Musical Society (on the site of the present St Cecilia’s Hall) in 1775 [see John Kitchen The Organs of St Cecilia’s Hall, University of Edinburgh BIOSJ 24 (2000)]. He was executor to Snetzler’s will in 1785 [Alan Barnes and Martin Renshaw The Life and Works of John Snetzler p314-5 (Ashgate 1994)]. So this may not be a Snetzler organ, but it may be close to the organ bought for the Edinburgh Musical Society (though that was larger). Registration instructions in the organ relate it to James Bartleman, who was a famous bass singer in late Georgian London. In the sale of his effects (Morning Chronicle Monday June 25th 1821) is included “a Finger Organ, by Snetzler and Jones, of fine quality”. So there is some connection with James Jones. The general style of the case, with its naturalistic carving, would date from about 1775. The way in which the organ is laid out, supported on the solid panels of the casework, rather than an independent support structure, is unusual, unlike other English chamber organs of the time. The entablature and pediment were evidently made in the 1930s, in imitation of the overdoors at Ditchley Park, when the organ was supplied for Nancy Lancaster, presumably by Sybil Colefax and John Fowler, when Nancy and her husband Ronald Tree were re-decorating the house. The organ was bought by Noel Mander at some point before 1967 when his workmen restored the organ. They removed the feeders of the bellows, and cut down the pipes and provided tuning slides, raising the pitch to A432Hz @ 15ºC and presumably introducing equal temperament. Otherwise the organ does not show any obvious re-building. Unfortunately the organ was dried out in St Cecilia’s Hall almost immediately after it was delivered, the top and middle leaves of the bellows were split and the wind chest spoilt with ciphers and runnings. 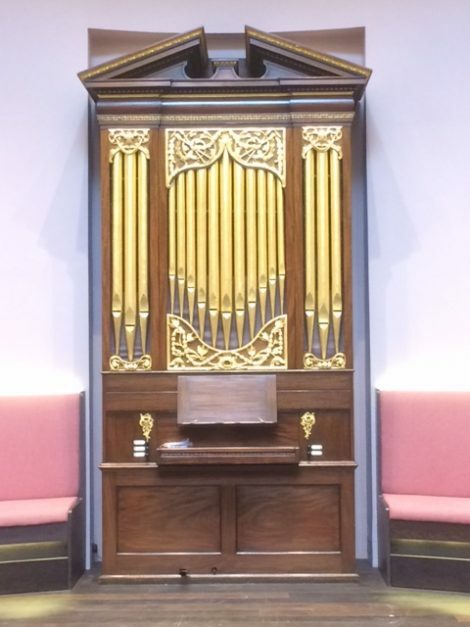 In 2015-6 the organ was stored by Martin Goetze and Dominic Gwynn Ltd in their workshop at Welbeck, Notts, during the re-development project, and was restored by Guillaume Zellner and Willie Hendry. Willie restored the wind chest, sealing the channels with cotton tape, re-leathering the pallets and making new leather pull-down purses. Guillaume restored the bellows, dismantling the reservoir and filling the splits in the leaves, making a new feeder bellows, re-leathering. The organ was re-assembled, adjusted and tuned by Edward Bennett, Dominic Gwynn and Willie Hendry in St Cecilia’s Hall on March 28th-30th 2017, when the organ was heard for the first time for 50 years. A shifting movement reduces to the Stop Diapason. The key compass is GG C AA D to e³.